What is a Village Savings and Loans Association? Given the high level of malnutrition in Ghana, the country needs a holistic approach of supplementation, food fortification and dietary diversification to combat malnutrition. Trax Ghana with donor and technical support of Self Help Africa (SHA) and International Potato Center (CIP) respectively is promoting the resilient nutritious Orange-Fleshed Sweet Potato (OFSP) rich in Vitamin A to improve the quality of household diet and income. 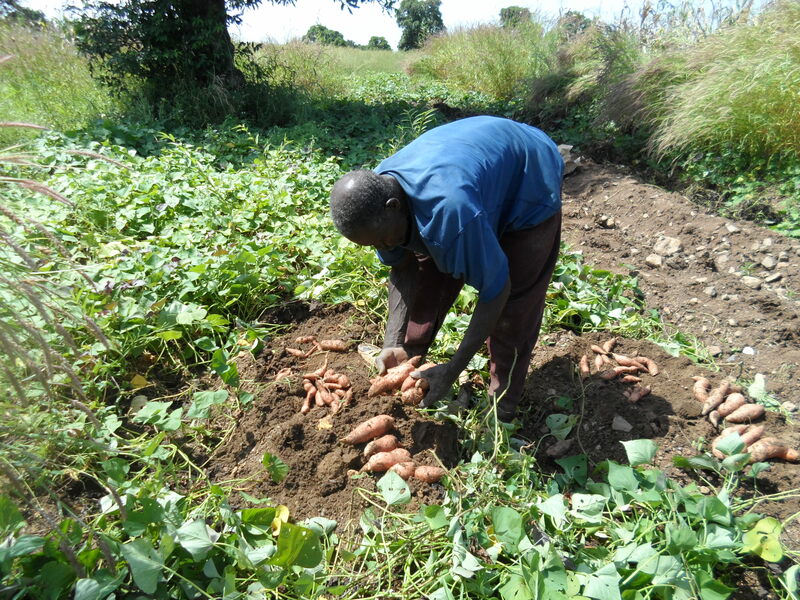 Mr. James Adongo, a farmer in Kabusgo Harvesting His OFSP roots. OFSP offers an opportunity to promote increased marketing and processing of Sweet potato, which will boost demand and ultimately producer income. Trax Ghana farmers at Pelungu (Nabdam district) and Kabusgo (Bongo district) in the Upper East region have carried out sample harvest of their cultivated OFSP during the first week of October 2015. According to the farmers, the quality and quantity of the OFSP harvested have exceeded that of the local variety and are hopeful this will help bridge the hunger gap and improve household income. 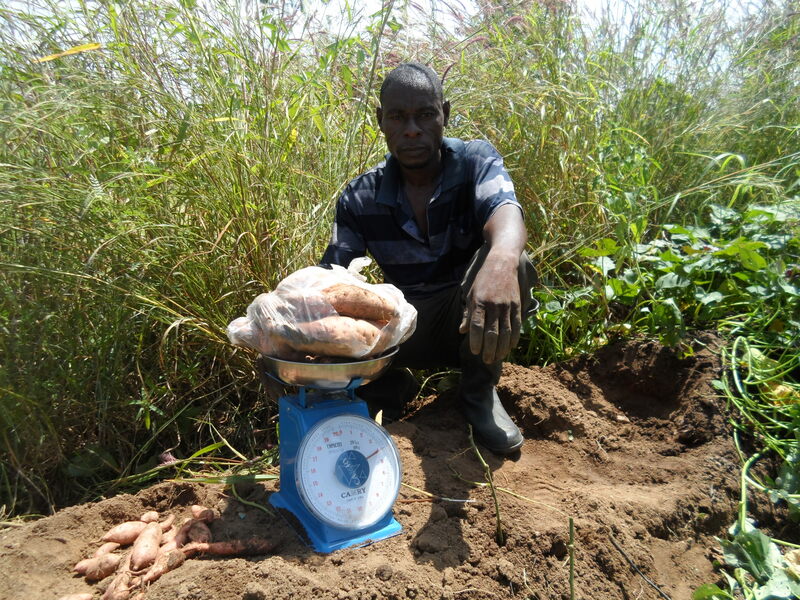 Mr. James Adongo, a farmer in Kabusgo weighing His OFSP roots during a Sample Harvest. The harvest time can be both the best and busiest time of the year for farmers to sell their surplus produce for greater returns on their investments. However, one of the biggest challenges for smallholders is getting a fair price for their produce. In Ghana, too often buyers take advantage of farmers and demand the “bush weight” of selling heaped bags filled to the brim which cheats farmers instead of paying per kilogram of their produce. The current practice whereby farm produce were priced at the discretion of the buyer turns to thwart the efforts of farmers at increasing their production levels and household income. 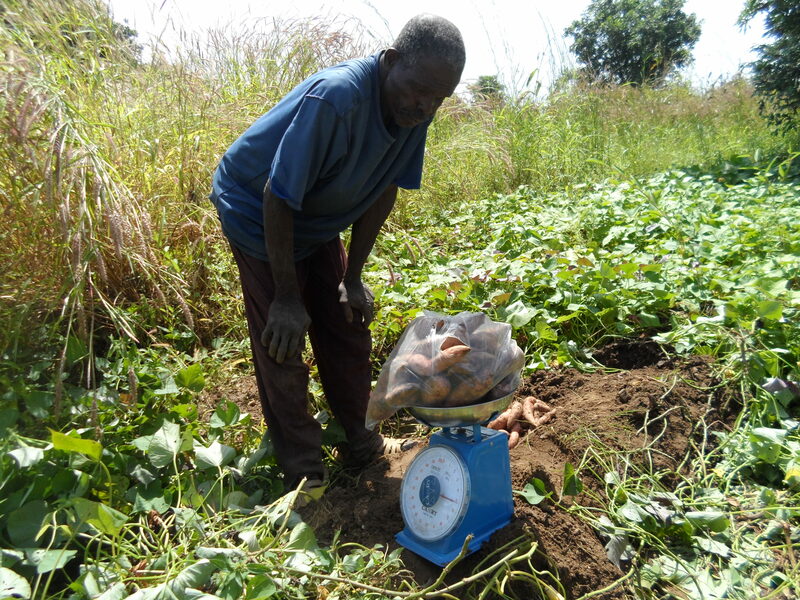 Mr. Salia Asongo, a farmer in Kabusgo weighing His OFSP roots during a Sample Harvest. To improve their bargaining power, Trax Ghana is facilitating the formation of OFSP producers association and also introduced farmers to the use of weighing scale in the marketing of farm produce to help protect them and consumers against exploitation by middlemen with respect to pricing of the commodity. The farmers were also cautioned not to manipulate their weighing scales to cheat customers. This entry was posted in Alternative Livelihoods, Climate change, Food Security, Orange Fleshed Sweet Potato and tagged Food security, income generation, nutrition, Orange Fleshed Sweetpotato. Bookmark the permalink.